In December, of 1974, two men labored arduously in the Amazon jungle, cutting down the ancient tropical forest. They goal was to carve a one hundred acre clearing in the jungle to homestead the land and develop a cattle ranch for their future prosperity. With axes, they cut down the jungle and felled the trees. Most would be left to dry throughout the dry season and then burnt just before the rains came again. This slash and burn method of farming would use the ash to sweeten the acidic soil and allow them to plant rice and corn. As they cut their way through the jungle, they came upon an ancient cedar tree, hundreds of years old. Their excitement grew as this rare red cedar tree would be their first “cash crop” as its valuable wood could be sold in town for cash. They chopped it down and then cut off the branches. Next they dug a six food deep pit underneath the tree. Now the serious work began. For the next two weeks they labored every day to cut the log up into timber blocks that were ten feet long, about a foot wide, and four inches thick. They used a two man cross cut saw. One would work in the pit below and the other standing on top of the log. Slowly they reduced the massive tree into the the timber blocks that would be then hauled by pack horse, two at a time into town. Each heavy timber block was tied to the pack horse’s back and the other end would drag on the ground. It would take a full day to haul each two block load into town. But the value of the timber made the job worth the effort as cash was scarce. For the next week they hauled the timber into town and offered it to different carpenters, wood working shops, and building sites. One local carpenter, Dario was his name, bought several of the timber blocks. With only a few hand tools, Dario would turn the lumber into boards and then turn the boards into furniture. He had only a hand saw, a brace and bits, a few chisels, screwdrivers, and a hammer. About this time, Jeanie and I arrived at this small village, deep in the Amazon jungle, to set up house and begin our work as missionaries, sharing the Good News of Jesus Christ. We had only a folding card table, a crib, a Coleman stove, and a few other items. I needed a table, or desk to work at, and so wandered by Dario’s shop one day and with my limited Spanish, explained to him what I wanted. We agreed on a price and he set to work. He cut boards out of a timber block for the table top and 2”X2”s for the legs. He fashioned a crude table with his crude tools. I soon was able to take it home and began using it for my work desk to study and write. I prepared sermons and lessons. I wrote newsletter articles and began translating and writing teaching materials. I used the table every day when I was not out hiking jungle trails to share the Good News. Years later when we moved into the city of Villavicencio to use that as a base of operations, we took that table with us. It was crude, even ugly, by city standards, but it served its purpose and avoiding the expense of buying something else. It became my radio desk later on as I used a ham radio to talk back to the states when phones did not exist in our area. 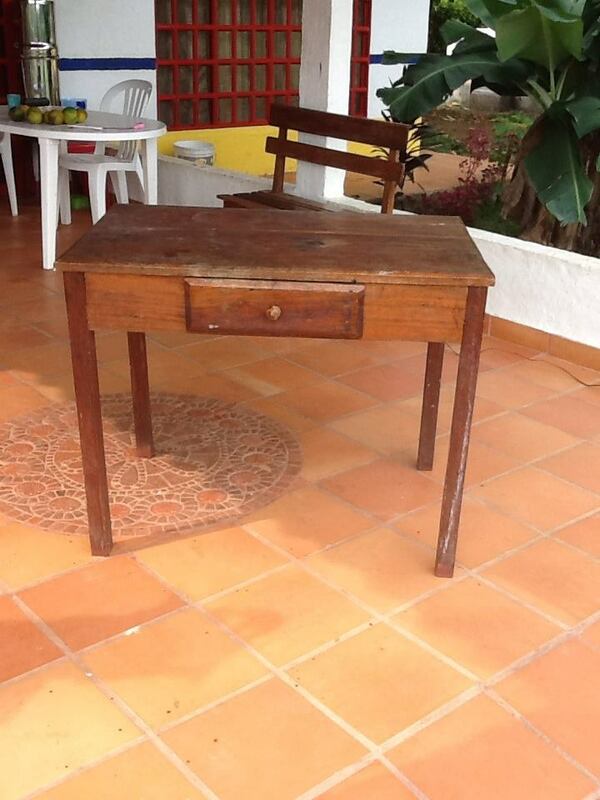 It served many purposes throughout the years but seemed to always end up being a work desk or table for reading, writing, and translating. When we moved to Bogota in the worst of the war years, it remained in Villavo and Martin Sanders used it for a time. When I moved back to Villavo about seven years ago, I again began to use it as my work desk there. Today, forty years after the tree was felled deep in the Amazon jungle, the wood from the ancient tree still serves me in the ministry here in Colombia. It is stained by candle wax and has a few burn marks on it where a candle burned down to the wood. It is still rustic, even ugly by modern standards and is crudely made at best. But it serves its purpose and enables me to use funds that would be used to buy a new desk to serve someone in need or to contribute to some church plant. It is the tale of the table; a story of stewardship and good use of what the Lord has given us.